Club México Bello celebrated holidays in style, as this Cinco de Mayo coronation in 1938 at the City Auditorium illustrates. 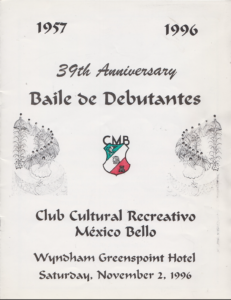 Invitation to the 1996 Debutante Ball hosted by México Bello at the Wyndham Greenspoint Hotel. 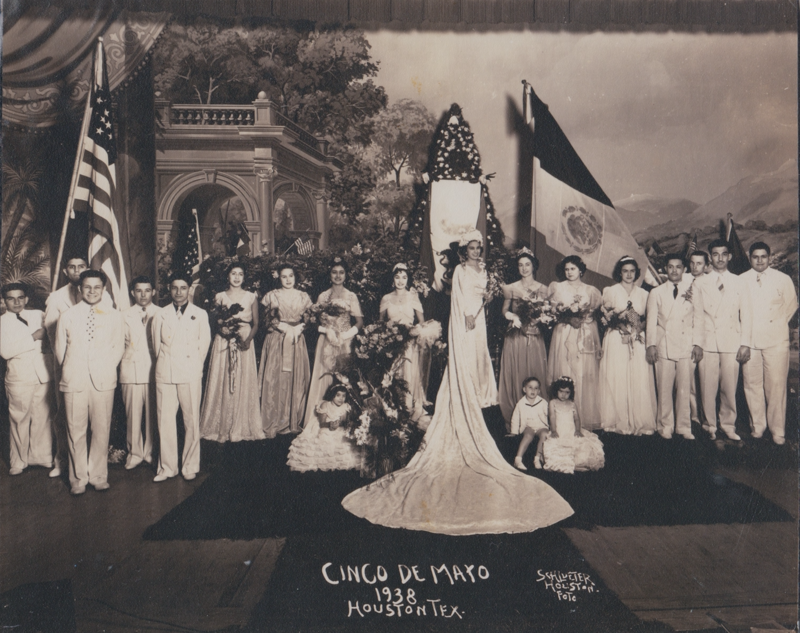 Dressed in elegant floor-length gowns and formal white suits, men, women, and children, flanked by flags from the United States and Mexico, crowded together for a picture in 1938. At the center stood the queen, holding a scepter and wearing an extravagant crown. This magnificent scene was captured at an event hosted by Club Cultural Recreativo México Bello, which became a model for many local Mexican American organizations. Still operating today, Club México Bello reached success and fame among Houstonians by creating a familiar environment for Mexican immigrants and introducing Mexican culture to non-Mexicans. It made a lasting imprint on Houston’s Mexican American community, by giving Mexican Americans an opportunity to attend sophisticated social events and present themselves as outstanding citizens to the Houston community. Pictures of México Bello’s officers in 1939. After the 1960s, the club limited its activities, primarily because other organizations filled the community’s needs. De León explains,“By the 1970s past its fiftieth year of existence, [Club México Bello] had decided to revise the club’s statutes as they seemed inapplicable to the changing times. 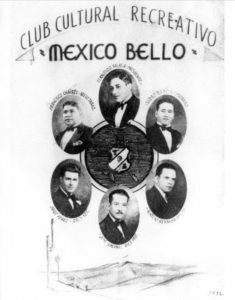 Instead of trying to perpetuate ‘lo mejor del carácter mexicano’ as it had done previously, it now sought to instill young people with ethnic pride in their Mexican heritage.” Initially Club México Bello had served as a vehicle for social change by altering public perceptions about Mexicans through its elegant balls and events. Within the Mexican American community, it helped to alleviate the nostalgia felt for the old country by recreating a piece of Mexico in Houston. Moving forward, however, Club México Bello shifted its focus to maintaining Mexican cultural traditions and pride in residents’ Mexican heritage. Today, the club still hosts its Black and White and Debutante balls. 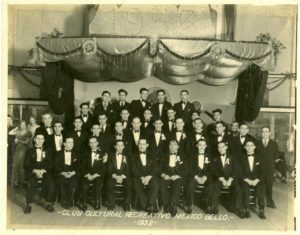 They remain as family traditions passed down from the first generation of club members and Mexican immigrants in 1924. Club México Bello began with a mission to put forth a positive image of Mexican Americans and to maintain Mexican tradition by creating a little Mexico abroad, “hacer un México chiquito en el extranjero.” By hosting elegant dances, participating in community events, and providing an outlet for Latin American expression, the club fulfilled its mission of creating a “Beautiful Mexico” in our Houston community. Club members also projected an elegant and sophisticated image of Mexicans to Houston’s Anglo community.